The drawing of a building (with a pyramid-like shape on top of it) with a head, the moon and saturn above it, surrounded by angels and other assorted figures, was removed from the western wall. 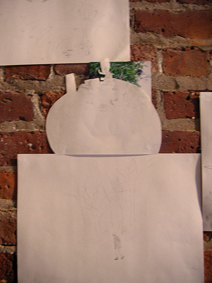 The part of the drawing with the building, the head, the moon and the planet Saturn was cut out. 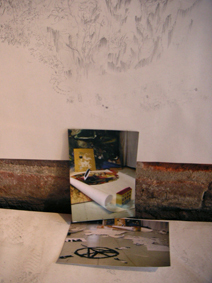 The remaining part of the drawing was placed on the eastern wall, attached to the cluster with the landscape drawing with the underground cavern. 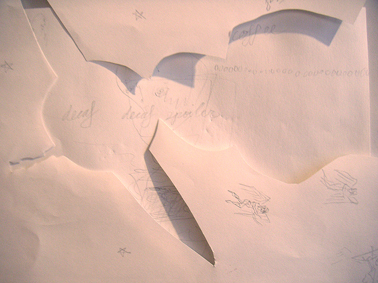 A cut-out photograph of a star-shaped stained-glass ceiling was taped to the upper portion of the drawing. 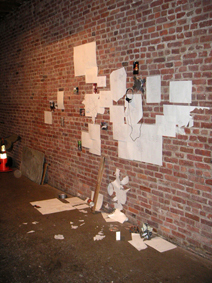 The drawing of two figures (one of them sleeping) outside a building with a large pizza above it was removed from the outer eastern wall. 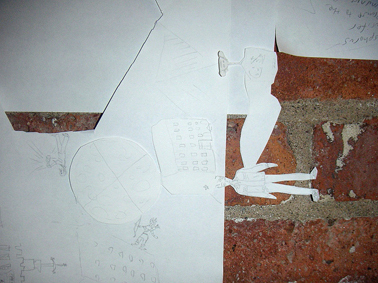 The two figures, the building and the large pizza were cut out of the drawing and attached to the right of the cut-out drawing of the angels and other assorted figures. 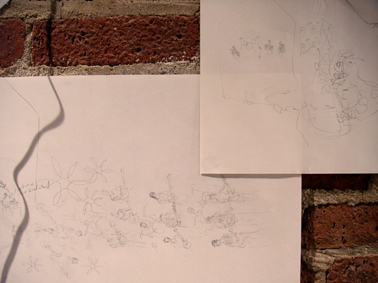 Added to the lower part of this cluster of drawings was another one of two houses with a large forest above/behind it. 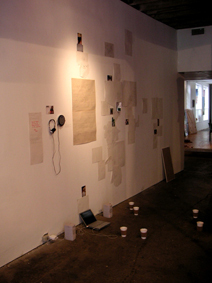 The photographs of a lego-building and the combined "anarchy" and "peace" symbols made out of coffeegrinds were placed on the floor, right below the drawing of the forest. 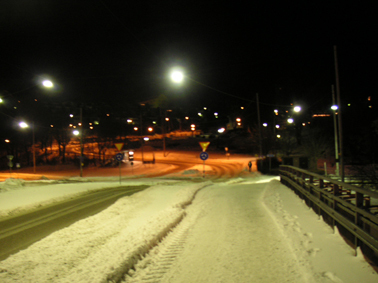 A photograph of a snow-covered bridge at night was placed to the right of the drawing of the angels and figures. 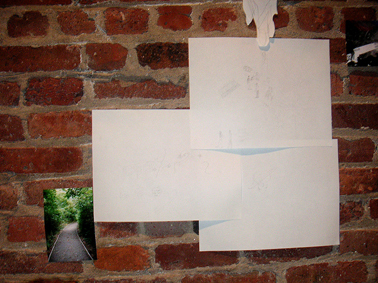 The drawing of a band rehearsing on the moon was removed from the wall and the image cut out and placed on top of the photograph of some clusters of berries growing on a tree (which was positioned above the drawing of a figure walking in a forest, linking it up with the drawing of the underground cavern). 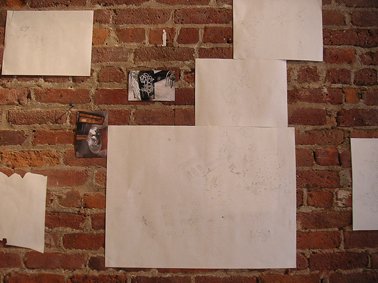 The drawing of some figures in a bar (with the word-balloons reading "Spuyten Duyvil") was moved, being placed instead above the cut-out drawing of the band rehearsing on the moon. 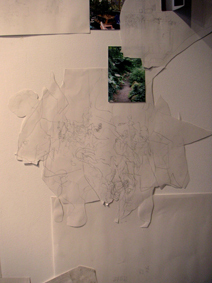 Below the drawing of the band Kartoffel Menschen Trio (placed to the right of the drawing of the figure walking in a forest) a photograph of a crossroads was placed. 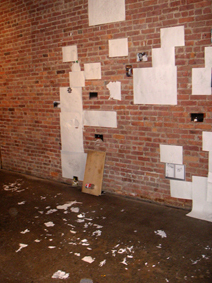 Some remains of a cut-out drawing were placed high up on the wall, at the point where it met the ceiling. The drawing of a figure listening to albums in a record store was rotated 90 degrees and moved to a new location on the outer eastern wall, being placed on top of the drawing of some buildings, a forest and a series of "anarchy" signs. 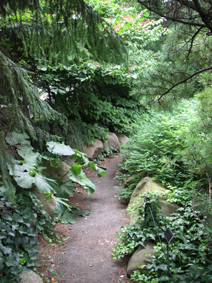 One of the instruments (the seven-stringed one) was placed leaning against the outer eastern wall. 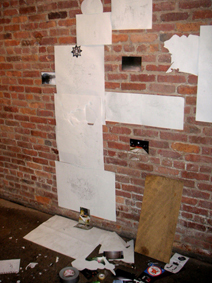 By the inner eastern wall the drawings of a figure playing trumpet and of a large group of people inside an apartment was removed from the wall and placed on the floor. 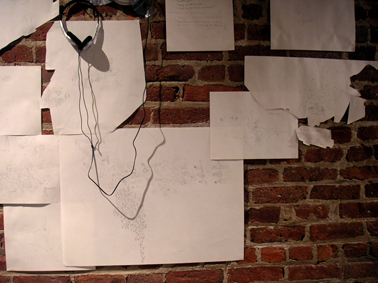 A large drawing of a figure sitting by a laptop in a house, with a large growth of grapevines attached to it, four groups of bands on the right hand side of it, a word-balloon reading "We formed a band" and the text "Look at us, we formed a band" was placed underneath the cut-out drawing of a house with a band rehearsing in it, linking it up to the drawing of a building with some instruments in it and the text "The revolution starts on monday". 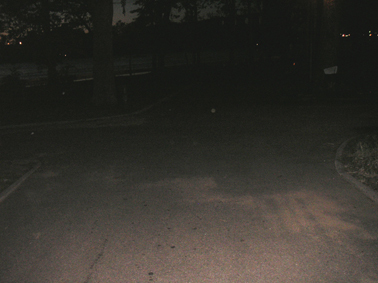 A photograph of a path surrounded by nature was placed to the left of the drawing of a street fair with the text "Try to get deep-fried Oreos" on it. 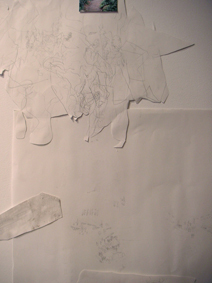 The drawing of a figure with the word-balloon reading "Jag vet att det vänder" in a jumble of tangled lines on the western wall was cut out. 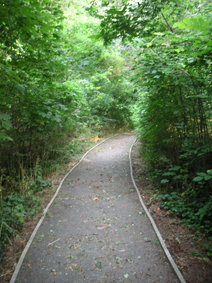 It remained in it's original position, but a photograph of a path in a garden was placed between it and the cut-out drawing of a figure in a kitchen inside a house. 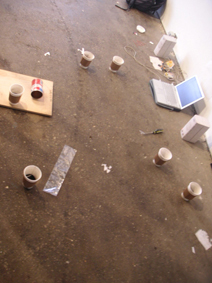 The coffeegrinds in the two take-way coffeecups were distributed to an additional four cups, making the amount of coffeecups with coffeegrinds in them on the floor by the western wall six in all.